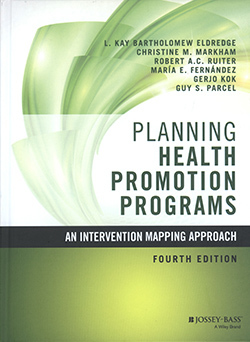 This book is a guide to planning health promotion programme using interventional mapping. Interventional mapping is a protocol for developing effective behavioural change. The mapping is characterised by three perspectives: an ecological approach; participation of all stakeholders, and the use of theories and evidence. It is divided into two sections: foundations and intervention mapping steps. The first reviews theories often used in health promotion and education, behaviour theories and environment theories. The second explores and explains intervention mapping steps and includes case studies. There is a discussion question and learning activity, a summary and a reference list at the end of each chapter. The final chapter explains how to use intervention mapping to adapt evidence-based interventions for new populations and settings. Throughout the book, key concepts are repeated in different contexts. These are the planning matrices, iterative planning, logic models and evaluation. This book is a great practical resource for developing and planning health promotion and health education programmes. It is user-friendly and practical, and is ideal for teaching.